Bored of eating the same old pizzas? Try this vibrant Chicken and Avocado Pizza, the perfect light summer meal. I’ve done it again, for your amusement as much as mine, I’ve updated an old recipe, taken new pictures and I’ll be sharing the recipe alongside the original photos today. This is my Chicken and Avocado Pizza. Just by looking at that first photo I’m sure there’s a couple of you debating whether or not this actually counts as pizza… We all know that traditional pizza involves a doughy base, smothered in delicious tomato sauce, topped with cheese and various other toppings. This variation isn’t too far from that: it has a doughy base, is smothered in sauce (just not a tomato one) and is topped with cheese, along with various other toppings! Surely that counts as a pizza…right? While I’m not here to debate what truly makes a pizza, I am here to convince you that once in a while swapping tomato sauce for avocado is a fun and TASTY thing to do! Is there such thing as too much avocado? When I first made this pizza back in 2013 avocado was just starting to become popular. That Christmas I’d made a delicious salmon and avocado terrine and when buying the ingredients I’d massively overestimated the number of avocados we would need. At the time avocados WEREN’T in our local supermarket so I’d stocked up just in case we didn’t have enough. After what felt like weeks (but was probably mere days) of avocado salad and homemade guacamole served with crisps I decided to come up with something different to use them up and so the Chicken and Avocado Pizza was born. The original recipe didn’t get a lot of traction. A few people couldn’t understand why I’d skip the tomato and opt for a guac-like base. I know it’s a little unconventional but with avocado on toast now featuring a gazillion times on instagram every morning I don’t think it’s too hard to imagine smearing avocado on to a pizza base. If you, like me, LOVE avocado you’ll be grateful for this new way of eating your favourite bright green fruit. Each time I make this pizza I do change it slightly. The best thing about pizza recipes of any variety is that you can adapt the recipe for your own personal tastes. I used to make it with mozzarella but I find that a soft, mild goats cheese is a much nicer texture alongside the soft, creamy avocado. I also used to finish the pizza with a drizzle of jalapeno sauce. I still do this on occasion, but today I opted to drizzle it with a little smokey ranch dressing. Swap tomato sauce for mashed avocado in this Chicken and Avocado Pizza! Pre-heat your oven to gas mark 6 / 180C. Roll out the ball of dough into a flat circle roughly half a centimetre thick. Place onto a baking sheet or preheated pizza stone. Bake without toppings for roughly 10-15 minutes or until beginning to turn golden. Scoop the flesh out of the avocados. Place the avocado into a blender with the lemon juice, garlic, oil and jalapeno and blitz until a smooth puree has formed. 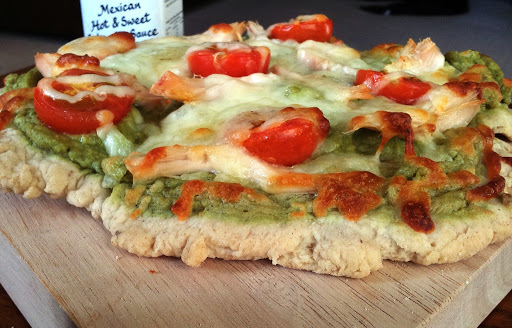 Remove the bare pizza base from the oven and spread with the avocado puree over the pizza base. Top with the cooked chicken and crumble over the goats cheese. Place back in the centre of the oven and bake until the chicken is piping hot and the cheese soft and melting. Drizzle with the smokey ranch dressing as desired. This pizza would work brilliantly as part of a main meal, served with salad and/or wedges. Alternatively serve on its own for an indulgent lunch! Depending on how much time you have on your hands you can even reduce the amount of prep and cooking time by using a ready baked flatbread or high quality pizza base. I won’t tell anyone if you don’t! So tell me, I’m dying to know. Does this count as pizza? Have your say in the comments below! Great before and after pics. I love adding smoky sauces or even a good dollop of mayo on my pizza! Genius idea! After all, pizza is simply the Italian for pie and you can put what ever you like in or on your pie. I’m going to try the avocado idea, might even cheat and use a flat bread for an even quicker version! I didn’t know that Janice! I totally feel justified topping it with avocado now 😛 thanks! What an amazing idea, I love avo so am totally convinced about swapping to an avo topping! Woohoo! Another avo lover 😛 it should go on everything shouldn’t it! I think this looks epic Emma. I need to update all of my old posts – some of them you can’t even distinguish what the dish is. I am intrigued enough to really want to try this out..avocado is starting to really grow on me. Thanks Becky 🙂 I’m still amazed at how bad some of my old photos are. I actually took down some old recipes that were really, really bad and they have a placeholder now saying “under construction” when your food looks like sick you know you’ve got a problem lol! Slowly but sure making some of my old favourites. It’s actually been quite good fun! Sounds like a lovely summer pizza! I LOVE everything with avocados so I would love to try this one. Thanks Diana! We eat way more than our fair share of avocados in this house 😛 I think we currently have 5 or six in the kitchen waiting to be devoured! Sounds like a plan 😀 enjoy! This def counts as pizza! And your revised photo is just beautiful which makes me want to revise some of my older posts. Thought: if you fold it, it also becomes a (messy) taco! Or gordita? Regardless, major yum! Oooooh I like your thinking Melissa 😉 I love messy food. Might give that a go next time! Glad you like the updated photos too. It’s nice reflecting back and seeing how far along the photos have come! You wouldn’t have to twist my arm to get me to eat this! Looks wonderful! YUM!!!! I’d eat this everyday! And to answer your question….no! There’s no such thing as too much avocado!! Oh you must Aish! Let me know what you think! I’ve never really thought about putting avocado on a pizza but how nutritious. This is totally a real pizza! Also it sounds DELICIOUS!!! I hadn’t thought of using avocado instead of tomato sauce, but as I am avocado obsessed, I always have a stock of avocados in different stages of ripeness (to prevent the disaster that would happen if I didn’t have a ripe avocado on hand). This sounds so crazy good- I’m going to start using a guac base on occasion!!! Thanks Pat – I’m all about making life easier 😉 so long as the food still tastes GREAT! OOoh I am loving the sound of this! I need this on my plate soon! It looks so easy and delicious. Hey Catherine thanks for stopping by. Glad you like it! duuuuuuude if I was at a restaurant right now I would order this. I am not at a restaurant however, so I will just start to dream of buying the ingredients so I can make this for dinner! Beauty!